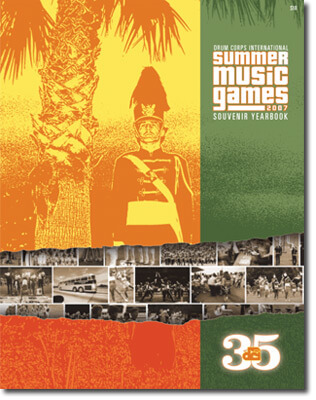 The 2007 Drum Corps International Summer Music Games Souvenir Yearbook is now on sale. The book includes action photographs, program information for every corps, event listings, drum corps history and much more. This 144-page full-color volume is great as an informational resource and as a souvenir. In addition to information related to the 2007 Summer Music Games Tour, this year's book includes a selection of classic photos celebrating Drum Corps International's 35th anniversary. Don't miss out on this opportunity to own a piece of drum corps history as today's drum corps make their way West to Rose Bowl Stadium and the 2007 Drum Corps International World Championships. The book is available for only $10 on DCI.org or at many of the Drum Corps International major events this summer. Order the 2007 Souvenir Yearbook today.